Cats- charismatic carnivores, fabulous felines, and the world's favourite animals! Wild species of cats occur throughout the world (except Australia and Antarctica), distributed across different ecosystems in 36-40 species. From the Snow Leopard of the Himalayas to the Flat-headed Cat of South-East Asia's marshes, wild cats occupy every imaginable habitat. Wild cats range in size from the 300 kg Tiger, to the 1.6 kg Rusty-spotted Cat! Wild cats are threatened by persecution, poaching and habitat loss throughout their ranges, with the Iberian Lynx, Flat-headed cat, Andean Mountain Cat and the Fishing Cat being the most endangered species. Get all these 40 cuddly kitties home in this giant poster! Prints and a wide range of merchandise including t-shirts, mugs, laptop skins, wall clocks are now available on my webstore here. Get the 201 Wild Cat calendar on Redbubble here. These cats are amazing ! 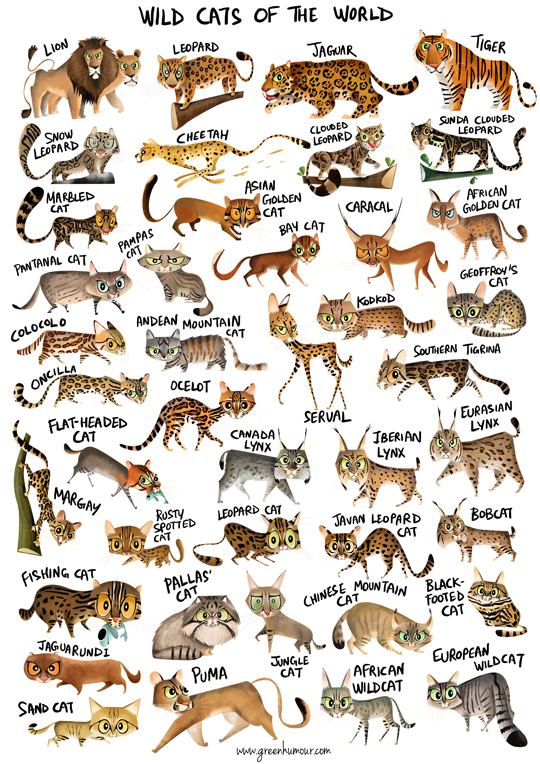 This is really beautiful work and good info Rohit on the cats from all over the world. Thanks. Hi Rohan - I am so glad you have made this poster of all the cats. I have your Cats of India poster on my website and it is very popular - hope you have had some sales. I will certainly be adding this one. Love the calendar option too.